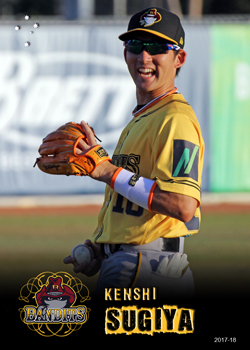 Sugiya is a Japanese import who played with the Brisbane Bandits during the 2017-18 ABL season. Sugiya is a veteran of Japan's NPB, having been playing with the Hokkaido Nippon-Ham Fighters since 2011. This site contains baseball cards that I have created using my own designs and photos (unless otherwise noted). They are not licenced by the ABL, the respective teams or players. The card designs I have made are for entertainment purposes only. No copyright or intellectual property infringement is intended, only a desire to help promote Australian baseball. Upshot of this is that whilst I enjoy doing this for fun, these cards aren't for sale, and exist only as a part of my private collection. Both the Australian Baseball League and the respective teams have started releasing their own baseball cards. I will try and document the information about these official cards as they are released, in addition to displaying my own custom made cards. This website and content (unless noted) is copyright © Adam East 2012-2018. Awesome Inc. theme. Powered by Blogger.